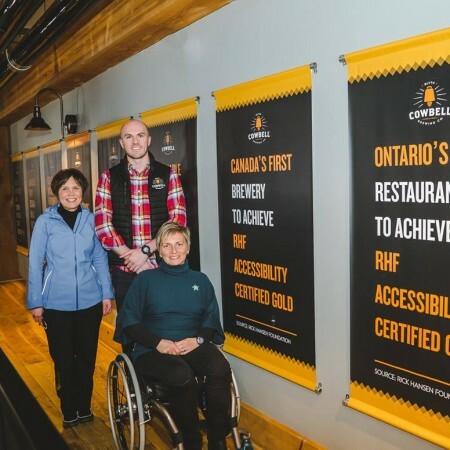 BLYTH, ON – Cowbell Brewing has announced that it is the first brewery in Canada and first private business in Ontario to receive an ‘Accessibility Certified Gold’ rating from the Rick Hansen Foundation Accessibility Certification (RHFAC) program. High-contrast heated sidewalks, elevator, braille signage, tactile attention indicators at top of all staircases, large format digital menu, two spacious universal washrooms (one with adult change table), and an accessible ‘catwalk’ viewing area above the brewhouse and cellar allowing visitors to see each stage of the brewing process. For more details on Cowbell’s accessibility features and certification, see the full announcement on the Rick Hansen Foundation website.